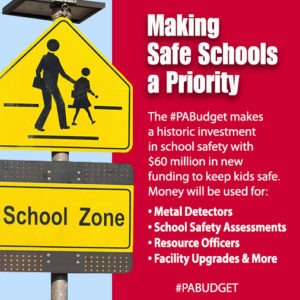 Pennsylvania legislators consider school safety a critical issue and a top priority. Lawmakers have responded to this issue by passing legislation to ensure our schools are a safe place for children and staff. The goal is to give schools the resources they need to identify threats so we can prevent school violence before it starts. This webpage was created to keep you updated on legislation involving school safety, and will continue to be updated as there are more public hearings and legislation. Lawmakers from both sides of the aisle came together to pass a comprehensive, bipartisan school safety bill that will make new resources available to school districts throughout the state. The new law emphasizes local control. 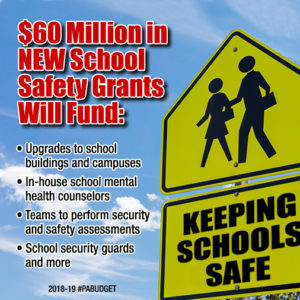 Each school district will have an opportunity to assess their unique needs and circumstances, allowing them to pursue safety options that are in the best interests of students. 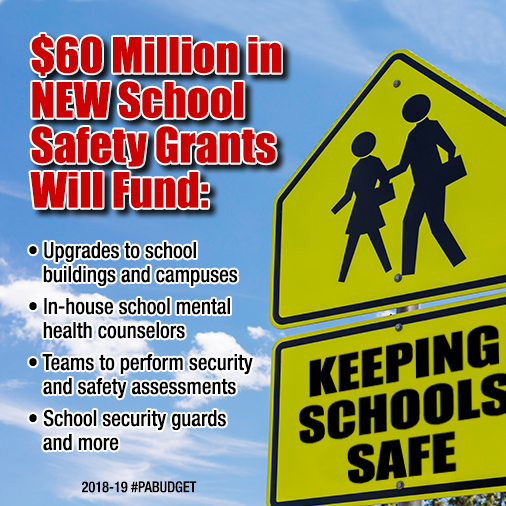 A new $60 million grant program that will give school districts flexible options to improve school safety, including hiring school security personnel and counselors, purchasing safety equipment like metal detectors, and implementing special programs to reduce violence in schools. A school threat reporting and monitoring system that will allow students, teachers, school employees and members of the community to anonymously report any potentially unsafe situations for students. School safety assessments and guidelines to help identify and address potential security issues. Mandatory training on school safety and security for school employees. Act 44 of 2018 (SB 1142) (Browne/Martin) – establishing the Safe2Say anonymous school threat reporting system, which collects information concerning unsafe, potentially harmful, dangerous, violent or criminal activities in schools or the threat of such activities. SB 383 (White) – giving school boards the option to allow certain school employees to carry firearms on school property to further enhance security measures. 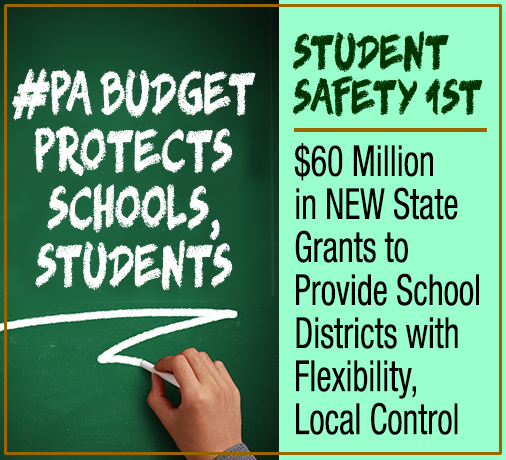 SB 1065 (McGarrigle) – redirecting funding of approximately $50 million to the Safe Schools Initiative. SB 1078 (Tomlinson/Regan) – allowing for security and safety matters to be discussed in Executive Session. SB 1103 (Greenleaf) – requiring schools to undergo annual safety assessment audits for purposes of the school’s safety plan. SB 1165 (Martin) – requiring that a juvenile charged with making terroristic threats be detained until a mental health evaluation and home risk assessment are completed. SB 1174 (Ward) – providing for a 90-day suspension of the driver’s license of anyone under 21 who makes a terroristic threat from anywhere against individuals or generally towards any school location. SB 1175 (Ward) – allowing law enforcement and prosecutors the ability to use an administrative subpoena to obtain subscriber information for a social media account from which they are investigating a threat made against a school. SB 1188 (Laughlin) – Allowing the use of tasers in providing for protection and defense of pupils. 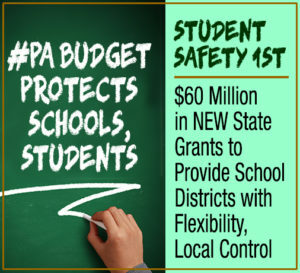 SB 1211 (Regan) – providing for the School Safety and Security Program. SB 1218 (McGarrigle) – providing for school safety and security training. Armed School Security Officers (Regan, not introduced) – implementing a security presence consisting of at least one armed, trained school security officer in all publicly funded schools.